With patients' needs at the heart of everything we do, our website has been designed to make it easy for you to gain instant access to the information you need. As well as specific practice details such as opening hours and closures and how to register, you’ll find a wealth of useful pages covering a wide range of health issues along with links to other relevant medical organisations. Current Practice list size 13,500. We have a small designated parking area for use by our patients. 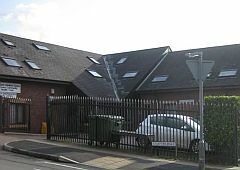 Facilities are user-friendly with wheelchair/pushchair access and a lift to the second floor situated in the main entrance hall for those unable to use the stairs. Patient toilets are located on the ground floor with baby changing facilities available on request on the second floor. We can provide a hearing loop for patients who have a hearing impairment and require assistance. We also use language line for patients whose first language is not English and require help. We also provide My Health Online. This is a facility to order your prescriptions and make appointments. Please note you need to register with us before you can access this facility. Please call into the surgery to register. Please note when you attend the surgery for an appointment you will be asked a number of questions so that you can be allocated to the correct department. Your local community pharmacist can now provide FREE ADVICE and TREATMENT for a range of common ailments without you having to make an appointment to see your GP. 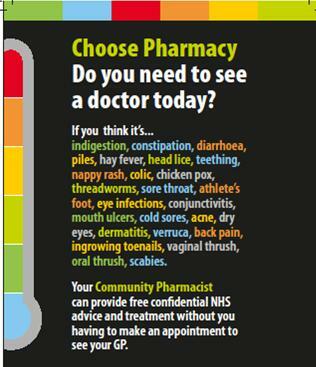 Please contact your local pharmacy to arrange a consultation. Self referral to Newport Direct Access Physiotherapy Service. Monday - Friday Notice: All calls into the surgery are recorded for training and monitoring purposes. You are now able to access a physiotherapy assessment directly rather than first seeing your GP if you have a musculoskeletal problem. From a brief assessment, the physiotherapist will identify if you need to be placed on the waiting list for full physiotherapy assessment and treatment, need to see your GP for further investigation or referral to another health care team. Direct access drop in sessions work on a ‘first come first served basis’. When maximum capacity is reached, you will need to attend on another day. If you have any concerns at all about your eyes, see a High Street optometrist (also known as an optician) straight away. They will tell you if you are eligible for a free eye health examination. Some eye diseases can lead to blindness or some loss of vision, but if detected early enough, your eyesight can often be saved. An eye health examination is just that – an examination of the health of your eyes. If the optometrist decides you need an eye health examination, it won’t cost you anything. You can find an optometrist in most High Streets in Wales. If you have a sight problem, you can go to your existing optometrist (if you have one) or just phone or walk into any practice that is convenient for you to get to. Please see http://www.eyecare.wales.nhs.uk for more information. 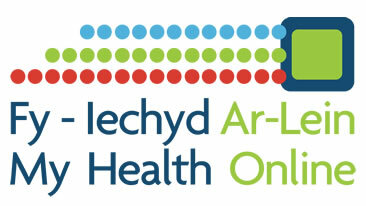 If you are unable to find NHS dental services or have urgent dental care you can contact the Aneurin Bevan University Health Board Dental Helpline on 01633 744387. The helpline is open Monday to Friday from 9am to 4pm. For dental advice in the evening, weekends and bank holidays please telephone 01633 744387. There is an advice only service Monday to Friday from 6.30pm to 10pm and from 8am to 10pm at weekends/bank holidays. Limited urgent dental appointments are available at weekends and bank holidays. Newport Direct Access Physiotherapy Service.